The significance of Red and Dead Sea is incomplete without the people who admire it and the tourist circuit in Jordan is incomplete without watching the waves at these two beautiful creations of mother earth. 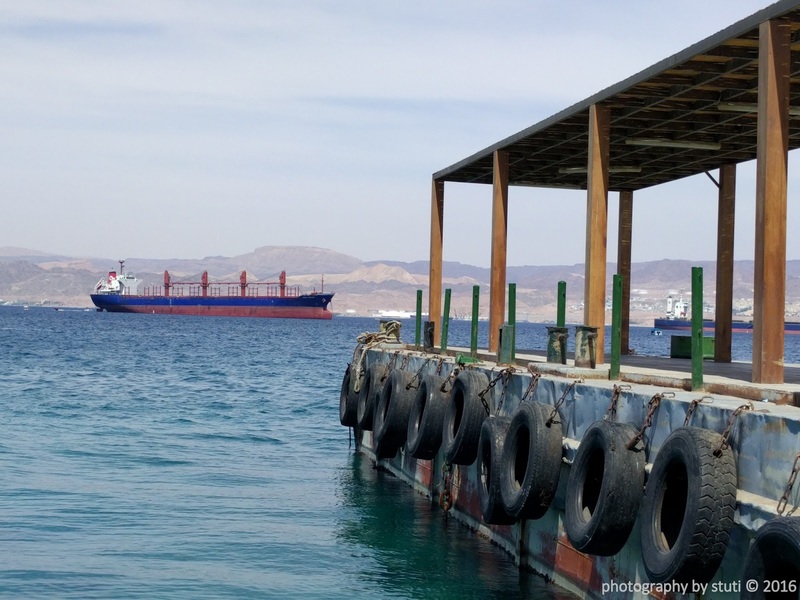 Aqaba, located at the north-eastern tip of Red Sea, is the only coastal city in Jordan and plays a major role in the development of the Jordanian economy, through the vibrant trade and tourism sectors. The golden sand and the barren lands told many unspoken tales as we traveled through the scenic Desert highway. There were two more highlights of this journey: first, the watermelon fields from where our guide Salah got us fresh watermelons. 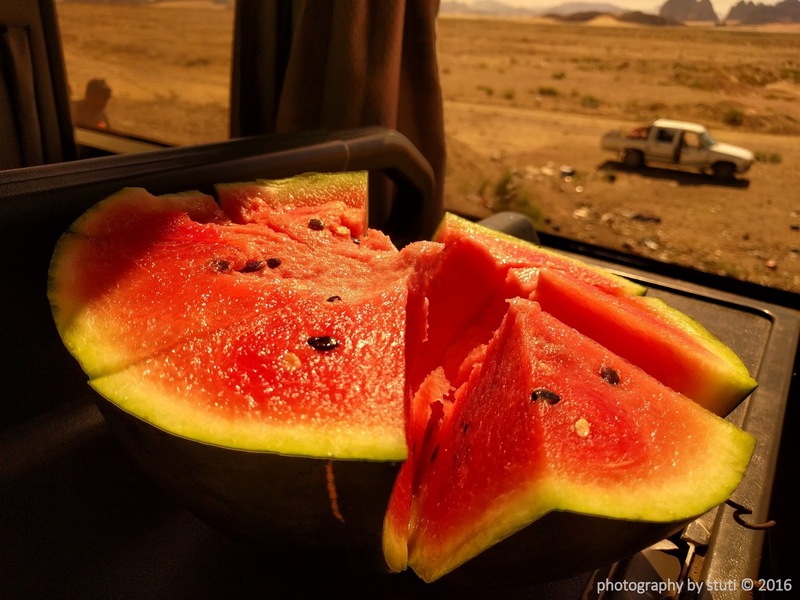 Relishing on them on the highway by the watermelon fields was an experience in itself. Second memorable experience was the railway track running parallel to the highway. There’s only one passenger railway in Jordan and to spot that is pure luck. We were in pure luck and got a chance to stop by and click pictures. The railway we came across are are called the Turkish Rail track while the passenger railway is named Hedjaz Jordan Railway. Moving from the mountain desert of Wadi Rum via Desert Highway to Aqaba was a pure contrast. As we reached Aqaba, the true blue Red Sea welcomed us. We boarded the luxury boat “Barakah". While some of my fellow travellers went onto to try snorkelling, the others decided to stay onboard and enjoy the ride. I was one among the latter and got a chance to indulge in a beautiful story narration by our guide who revealed to us that from Red Sea, the Gulf of Aqaba section (there are two more sections which borders many other countries) one can easily spot Israel and Eqypt while Saudi Arab was a mere 2 kms away. The information itself was quite overwhelming. I could see the inhabited Israel while only one huge building from Egypt was visible (a hotel resort which was attacked by terrorists around 5-6 years back). The major part of the continent Africa started from behind the mountains in picture. After storytelling and chit chatting I retired to deck area. It was so peaceful to watch waves and feel the sea breeze. I just couldn’t help but wonder that how a peaceful place like this can be racked by some dim witted people who on the name of God create havoc. 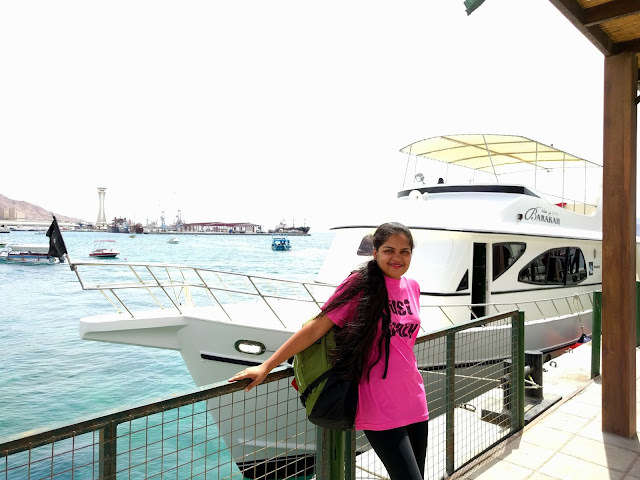 At the same time the waves had a calming effect on me. The waves had a calming effect on me. As they touched my feet I was assured that the beauty of nature is untouched from beneath, it will always rise. The golden sand and a few buildings on the shore reflecting the colour of surroundings was a sight to behold and the colour of the water, was the bluest I had ever seen. The experience was followed by Live barbeque on the boat and a hearty meal in the small dining area. Post lunch we checked in to Movenpick Hotels & Resort, which is a true example of incredible hospitality and luxury. The view from my room was amazing (More about the resort will follow in another post). Later at night we dined in open at Royal Yacht Club. The view was lovely! 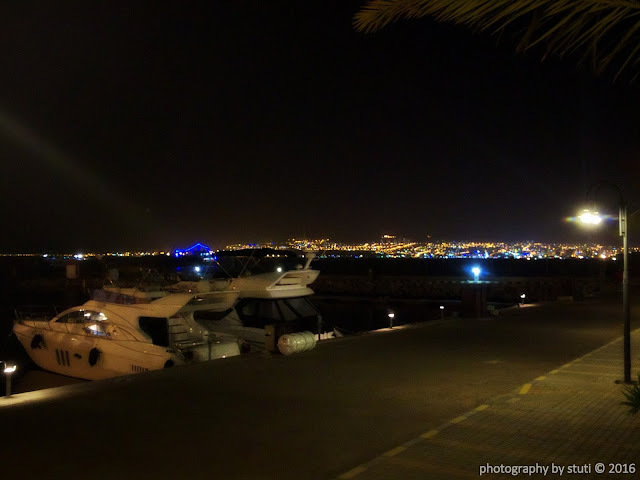 Light breeze, yachts dancing in water and twinkling lights from Israel made for a perfect evening. The evening had just started. Post dinner we left for a trail in the city of Aqaba. The night was beautiful and adorned with the city lights. While strolling through the market, we heard a beautiful music but it was not coming out of any musical instrument instead from an Ice cream parlour, Bakdash. Mohammed was making Ice cream by way of music, he was beating the dough with a long wooden log while creating music, and one could not stop but name it the Musical Ice cream. It was not like any other regular ice cream but had a typical fragrance of the desert country with various dry fruits garnished on top. Here’s a small video. We decided to take a little detour and enjoy the night a little more. 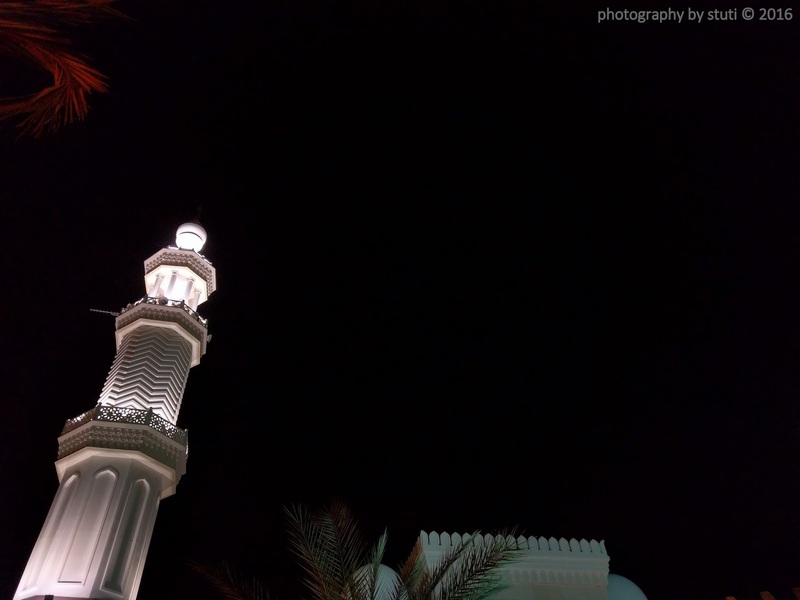 Walking by King Al-Hussein Bin Talal Street we saw a beautiful mosque (Al Sharif Hussein Bin Ali mosque) which was all white and green with lights. We also saw graffiti on the walls which ran parallel to the wide road. The day ended on a starry note while the stay at Aqaba was a wavy breezy affair. For second half of “sun, sand and sea” stay tuned for the next post! From your description the place looks much more alive than thought. The musical ice-cream asserts that so many things we just don't know..
That's so true. Musical icecream was a first for me too. Jordan is such a complete package. I still recommend it when somebody asks me for travel destination ideas. Surprisingly different is what I could describe this unique country. So much more to offer then what you think of. Thanks for introducing us to Jordan. Aquaba the name is full of mystery itself. The photos are great and I will add to my bucket list. Keep it going. Thank you ..Glad that you liked it. Musical ice cream sounds amazing. I love desserts with local flavors. I have also heard how beautiful it is to dive in the Red Sea. Someday, I hope to check it out for myself. Looks like you had a great time in Jordan! You just convinced me that I need to really have visit to this beautiful country really soon! 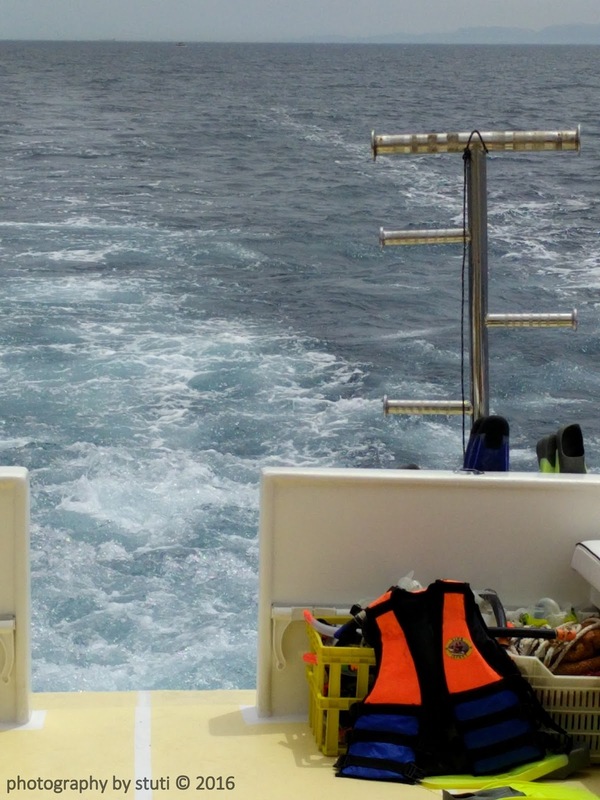 Although, like you I wouldnt never ever miss the chance to discover the underwater of Red sea! Cant wait! Yeah I know. Anyway, if you need any help with the itinerary, let me know. I think it is every guide that tells you in Aqaba, that you can spot Egypt and Israel right across because that's exactly what our guide told us too, when we went 4 years ago. 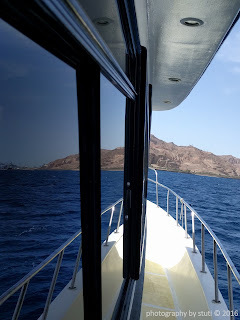 I loved Jordan, contrary to many other people's experience and even though Wadi Rum & Petra were the obvious highlights on my trip, snorkelling in the lovely blue waters of Aqaba was a great experience too! Then there is a hidden gem near madaba, a hot water spring. One shall visit it too. Jordan is sooo on my bucket list with so many places ot visit. I'd love to try floating on the Dead Sea and if it really works! Did you do that? I hear that there is so much salt that it makes you very bouyant. The red sea indeed looks lovely, I hope to see it one day. I have heard it has antiseptic properties too, is that true? The food at the barbeque looks so delicious, all that on a boat, an amazing experience for sure. I didn't know about the boat tour, glad I know now. That looks like a wonderful time spent in Jordan. It has such varied landscapes and experiences. And its quite an offbeat destination i must say. Eager to know how Jordan treated you, did you ever feel unsafe? Was it a group tour? And it must be a costly trip i assume.